When we go to the doctor, several things happen when reach an exam room. A nurse, or medical assistant takes our temperature and blood pressure and listens to our heart – all tests measuring our vital signs. We ask about the numbers, and more often than not have an idea if they fall within acceptable ranges. But do we know why measuring vital signs are always part of any examination? Are they performed just to keep us busy, or are there valid medical reasons behind them? As you may suspect, there are significant reasons a doctor needs to know our vital signs before performing additional aspects of a physical examination. When vital signs fall within normal ranges, it indicates that your body is operating as it should. But ranges falling outside of what is typical for your age, can be a sign of a medical problem. The amount of heat contained in the body is its temperature. Most people maintain a body temperature anywhere between 97.7°F to 99.5°F (36.5°C to 37.5°C). Gender, age, time of day and even physical activity can impact your body’s temperature. Additionally, some people always seem to be hot while others always seem to be cold. So what’s normal for you may be different than what’s typical for someone else. You can determine your baseline temperature by taking it at the same time every day over a week or two. The body is very good at maintaining whatever your normal temperature is. It makes adjustments regardless of the weather. But if your temperature is too high or too low, it can signal an underlying medical condition. Fever and if a medication is effectively reducing it. Hyperthermia – very high body temperatures in people who have been exposed to heat. Hypothermia – very low body temperatures in people who have been exposed to cold. Excessively high or low body temperatures signal that it may be in distress. With the use of a medical history, a physician can determine whether there is cause for concern, or if the condition can be eliminated through a standard treatment option. Heart rhythm – between 60 and 100 beats per minute in most adults. 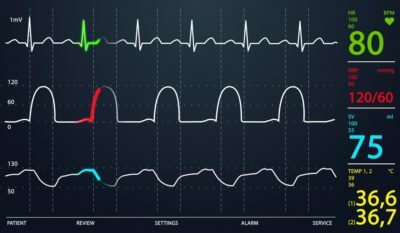 Strength of the pulse – how efficiently your heart works. Your pulse rate may fluctuate with exercise, illness, injury, and emotions. Age, gender, and athleticism can also impact a pulse rate. Changes in pulse rate are expected as a person ages, but too much change, or an unexpected change at any age may signal that a heart condition, or other medical concern is developing. Diabetes or internal body conditions that, if untreated, could lead to diabetes. Lack of exercise – An indicator of heart-health and level of fitness is the ability of your heart to quickly lower back to a regular beat after intense activity. Healthier hearts recover faster than unhealthy ones or ones unaccustomed to physical activity. Medication – The addition of medication, or changes in medication can impact the heart rate. Similar to counting the number of times your heart beats per minute, your respiration rate is the number of breaths you take in a minute. And, like other vital signs, respiration rates may be impacted by fever, illness, and other medical conditions. One thing medical personnel check when taking a respiration rate is if a person has any difficulty breathing. An average respiration rate for an adult person at rest ranges from 12 to 16 breaths per minute. An abnormal respiration rate, increased or decreased, may be symptomatic of an underlying condition which must be treated. Some of these conditions are included below. Asthma – Asthma attacks may increase respiratory rates. Even the smallest increase in respiratory rate could signal a worsening condition. Dehydration – Dehydration can result in more rapid breathing. Fever- When a fever is present a person will breath faster trying to lose body heat. Infections – Flu, pneumonia, and other infections can result in rapid breathing. Sleep apnea – With sleep apnea, people often have episodes where they stop breathing mixed with bouts of decreased and elevated breathing rates. It’s important to note that rate of breathing is not the same as feeling short of breath. Sometimes a person can feel short of breath and have an unusual respiratory rate, but the two may be unrelated. Only your healthcare provider can determine if they are linked. Blood pressure consists of two numbers. The top number, systolic blood pressure tells a physician or other qualified healthcare provider how much pressure your blood is exerting against your artery walls when the heart beats. The bottom number, diastolic blood pressure reveals how much pressure your blood is exerting against your artery walls while the heart is resting between beats. Although both numbers are significant, doctors tend to pay more attention to systolic blood pressure, or the top number because it could mean a person is at risk for cardiovascular disease. The risk is particularly true if the person is 50 years or older. 140 mm Hg or greater systolic pressure (top number). 90 mm Hg or greater diastolic pressure (bottom number). In 2003, the NHLBI added a new blood pressure category which they called prehypertension, which means a person is at risk of developing hypertension. But in late 2017, the NHLBI published a new comprehensive set of guidelines which eliminates the prehypertension category. In the new blood pressure guidelines, the NHLBI lowered the range of what is considered high blood pressure. The new range means approximately 46 percent of the U.S. adult population can be diagnosed as hypertensive. Younger people are the ones most impacted by the new definition, with the prevalence of hypertension doubling for women under 45 and tripling for men under 45. . The following chart shows the new guidelines and associated stages of hypertension. Normal Less than 120/80 mm Hg. Elevated Systolic between 120-129 and diastolic less than 80. Stage 1 Systolic between 130-139 or diastolic between 80-89. Stage 2 Systolic at least 140 or diastolic at least 90 mm Hg. Hypertensive crisis Systolic over 180 and/or diastolic over 120, with patients needing prompt changes in medication if there are no other indications of problems, or immediate hospitalization if there are signs of organ damage. Bear in mind these are only guidelines. Age, family history, insufficient exercise, excessive sodium in your diet, high stress and a variety of other factors can affect your blood pressure. Some of these factors are situational. When the situation resolves, blood pressure may return to normal ranges. So, an isolated high blood pressure reading may not be indicative of a problem. If readings remain elevated after a series of measurements taken over days or weeks, then see your healthcare professional for possible treatment. Can your blood pressure ever be too low? As with high blood pressure, some situational factors can create a single reading of lower than average blood pressure. Certain medications, pregnancy, allergic reactions, or inadequate nutrients such as Vitamin B-12 can result in low blood pressure numbers. If you are experiencing physical symptoms along with low blood pressure, it’s best to see your physician to determine your risk of a health condition. Want to learn more about vital signs? Tests measuring your vital signs are quick, and the methods relatively easy when compared to other tests. If you are interested in learning how you can take your vital sign measurements at home, The American Heart Association can tell you how on their website.